The Berrick Saul Building is located at the heart of the University of York’s Heslington West campus. The building can be easily reached by public transport: the UoY66 bus runs from the railway station to the campus via the city centre every ten to fifteen minutes: please alight at the Morrell Library stop, and walk towards the Market Square from which you will see signs to the building. 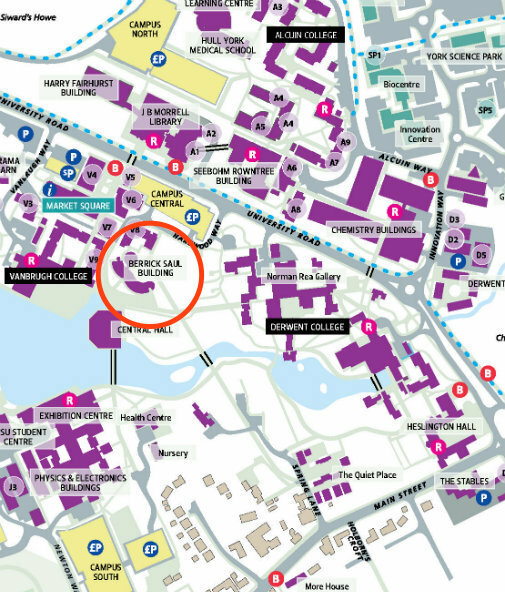 Parking is available less than five minutes’ walk from the HRC in Campus Central Car Park; visitors with mobility difficulties can drive or be dropped off at the door of the Berrick Saul building, in which the HRC is located. The building is fully accessible for disabled visitors. York is on the main East Coast Line from London King’s Cross to Edinburgh. Fast trains leave from both north and south at frequent intervals. There is also a direct service across the Pennines between York, Leeds and Manchester Airport. The University is two miles from the railway station and you will need to get a bus or taxi onto campus. A journey by taxi from the railway station to the University will take approximately 15 minutes. There is a taxi rank just outside the station.